Stripper Suds Car Wash Soap cleans and shines with the smell of success. Chemical Guys master chemists distilled that ohh-so-familiar scent you won’t smell anywhere else, and blended it with a premium super-slick high foam car wash soap. The fun fragrance evokes memories made on the brass poles and in the private booths of elegant clubs. Was her name Summer? Candy? Cinnamon? Even if you couldn’t take her home, here’s a keepsake for every car wash! Stripper Suds Soap lifts and lubricates abrasive dirt from paintwork, and gently guides it away with foaming suds before it can scratch. The pH-balanced formula will not spot or stain in direct sunlight, and will not strip wax or sealant off of paintwork. Optical select gloss enhancers restore a deep wet shine to any wax or sealant coat to make any car look freshly polished and waxed. Use Stripper Suds Soap in any two-bucket, foam gun, or foam cannon car wash method for a brilliant scratch-free shine. Swirls and scratches are unsightly scars on paintwork. Improper washing, drying, or other bad touch with too much friction scratches paint and leads to intense swirl marks. 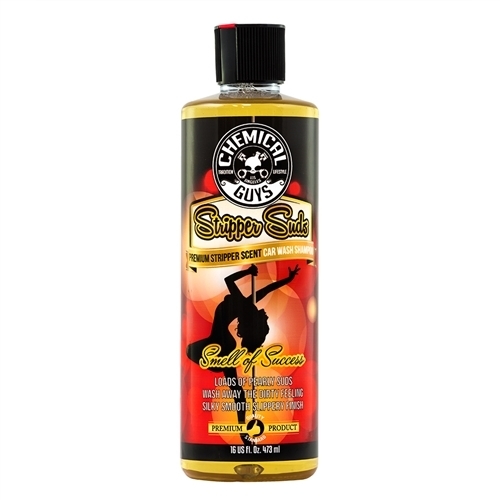 Stripper Suds Car Wash Soap lubricates dirt and grime for scratch-free cleaning on any car paintwork. The pH-balanced formula rinses clean without spots or stains, even when washed in direct sunlight. Gentle cleansers remove dirt and grime without stripping any wax or sealant from the vehicle. Wash any color paint, wheels, glass, plastic, and undercarriage parts with Stripper Suds Car Wash Soap. Mix 1-3 ounces of Stripper Suds Soap into a 5 gallon bucket of water for plenty of soapy suds to wash an entire car. Add Stripper Suds Soap to a foam gun or foam cannon to turn any car wash into a thick car wash foam party. Give dirt, grime, and debris the full monty with Chemical Guys Stripper Car Wash Soap. Maintaining your vehicle’s protective wax or sealant layer is important. Wax and sealant protect your car from UV rays, water spots, and contamination. Stripper Suds works to maintain your protective wax or sealant layer. The unique washing formula allows dirt, grime, and filth to be washed away while still maintaining your protective layer. Stripper Suds is designed to wash any exterior surface with precision. Simply mix 1-3 ounces of Stripper Suds to 5 gallons of water to create a superior surface cleanser with a generous amount of wash suds. The advanced super polymers glide over your current wax or sealant layer ensuring that your car, truck, motorcycle, or RV stays protected against the elements. Stripper Suds will show you the true definition of clean. © Copyright 2015 mountune LLC. All Rights Reserved.